When the exterior walls, floors, or roof of a commercial building or home begins to stain and change colour, the cause is very often organic. Atmospheric moulds, like mildew, are growing on, and in, the surface of your home or workplace, alongside countless other fungi, bacteria, lichens, moss, and algae which can cause the problem. Organic atmospheric growth causes cosmetic changes of colour and mouldy deterioration, and as well as looking unsightly the deep rooted nature of these unpleasant growths can mean that, left untreated, they cause long term structural damage too. 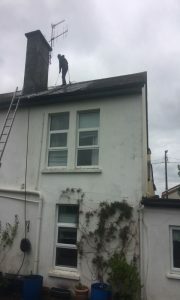 Up until now high pressure cleaning has been the only service treatment option available to get rid of organic growth. This relies on blasting the stain, literally, off the surface. Unfortunately the combination of heat and high pressure required to do this properly can damage surfaces including render, brickwork, guttering, stonework, tiles, roofs, patio, and solar panels. High pressure treatments often leave infecting spores behind too, as the high pressure wash cannot penetrate the surface to eliminate the infection, so a costly clean up is needed again sooner rather than later – often in a matter of weeks. Softwashing changes all this- it thoroughly removes building infections in one treatment in all but the worst cases, without the risk and damage of high pressure. 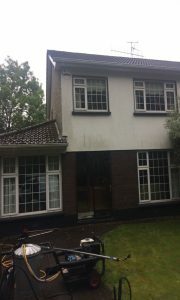 Softwashing is a revolutionary technique pioneered across the USA and EU, using the simple power of chemistry to safely and sustainably remove mould, fungus, and bacterial infections that can blight roofing and building exteriors, as well reverse the cosmetic damage caused by graffiti. Fully approved to the exacting health and safety standards, Softwashing is scientifically proven to be both a safe and environmentally sound solution to the problem.